Arsenal vs Manchester City | Premier League & FA Cup champions collide in the first competitive fixture of the season. Both sides have less that full strength squads but both have questions to be answered. Rishad Bharucha has a look at what Arsenal need to deal with. Much has changed since Arsenal were beaten 6-3 by Manchester City at the Etihad Stadium in the Premier League last season. Both teams went on to win domestic honours, with City taking the Premier League crown and Arsenal coming from behind to win the FA Cup final. While Arsenal have invested heavily to bring in reinforcements, Manchester City have supplemented their title winning squad with some quality players. On paper, we could be in for a more even game this time around but much depends on the fitness of the two teams in their preparation for the curtain raiser to the Premier League season, the Community Shield. While both sides have no dearth of quality, it could well be the teams’ overall tactical approach that decides this game. How will Arsenal cope with the physicality of City’s midfield? Both Arsenal and Manchester City look likely to play 4-2-3-1 with two holding midfielders protecting their defense. Arsène Wenger has spoken about Jack Wilshere being “in his best pre-season shape in three years” and also brushed away suggestions for the need to sign a box-to-box midfielder. This could well see Jack lining up against City alongside either Mikel Arteta or Mathieu Flamini in the middle of the park. There is a mixed feeling amongst Arsenal fans about thirty-two year old Arteta’s effectiveness. Flamini was one of the only players who kept his discipline against City when the two sides last met at the Etihad Stadium in that heavy defeat for Arsenal and might warrant a better shout for a place this time. A fighting duo of Wilshere and Flamini might be ideal in this fixture to combat the physical threat of Yaya Touré and new signing Fernando. In addition to keeping their positional discipline, they would do well to press high and deny these two City midfielders any time and space on the ball. In the absence of Fernandinho, whom City manager Manuel Pellegrini has confirmed he will be without, they are likely to play Stevan Jovetić as a central attacking midfielder, who will likely be up against Aaron Ramsey. If Flamini is the combative, defensive engine of this Arsenal team, then Ramsey offers the same energy offensively. With Ramsey driving the play forward in possession, Jovetić’s influence can be nullified, helping Arsenal to also reduce the supply to City’s attacking midfielders like David Silva and Samir Nasri. 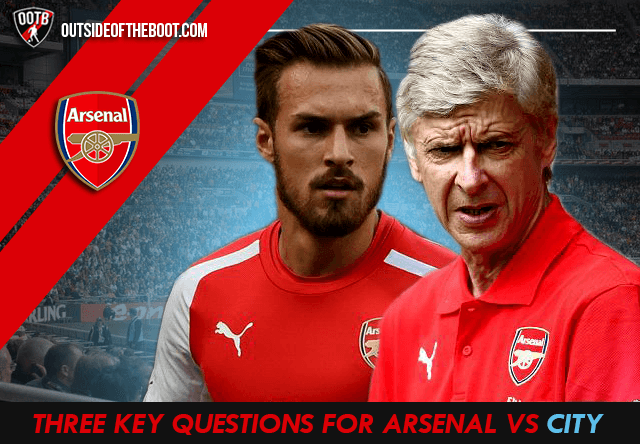 How will Arsenal win the battle of the flanks? On the right of midfield, if new signing Alexis Sanchez starts for Arsenal, he could be up against Kolarov. It remains to be seen how Alexis’ fitness will affect his place in the starting lineup today. If he plays however, he certainly has the trickery and directness to cause Kolarov problems on his flank. Santi Cazorla could well be up against Gael Clichy or Micah Richards at the opposite end. The diminutive Spaniard is more well-integrated into Arsenal’s fitness schedule at the moment but he could certainly cause the Frenchman problems down that flank. Cazorla’s tendency to drift inside more could create space for Kieran Gibbs on the overlap which would test City’s right side and push Samir Nasri back as well. David Silva and Samir Nasri will be a handful for Gibbs and new signing Mathieu Debuchy. Both midfielders like to play like inside forwards and set up attacks through the middle, so the two Arsenal full backs will have to rely on Cazorla and Alexis to track back as well. New signing Debuchy has Premier League experience playing for Newcastle United and should as such slot in seamlessly into the position vacated by City’s new right back signing, Bacary Sagna. How will Arsenal penetrate City’s back four? A title winning defense is always hard to penetrate, even though some might argue that Pellegrini was lucky to get the most out of Martin Demichelis at center back. The absence of City’s regular defensive pairing of captain Vincent Kompany and Demichelis could certainly prove to be a boon for Arsenal with a rather young central defense of Matija Nastasic and potentially one of Karim Rekik or Dedryck Boyata likely to replace them. Arsenal’s presently fit striker options include Olivier Giroud, Yaya Sanogo and Joel Campbell, although Alexis can also play in that position. Unless Wenger throws a surprise Sanogo party, Giroud is likely to start as the lone striker for Arsenal. Giroud has been accused by some fans of being a bit static in the Emirates Cup, but fans need to keep in mind that he played a World Cup semi final for France and is still behind the others in his pre-season fitness. Sanogo and Campbell will provide Arsenal with good firepower from the bench and one or the other will likely feature at some stage in the game. Giroud’s hold up and link up play will be crucial to bring Alexis and Cazorla into advanced positions in the final third. Giroud will face a tough battle to win the first aerial ball in both open play and set pieces with Nastasic in particular someone who could deal with these balls. Sanogo’s movement and Campbell’s directness could cause this defensive pairing problems as well if Wenger chooses to bring them on. In addition to these three key tactical areas, Arsenal will have to make the most of their set piece situations in this potentially tight fixture, particularly while defending them. City have a lot of height in their squad that could cause Arsenal problems. In the absence of World Cup winner, Per Mertesacker, new Arsenal signing Calum Chambers will likely face his first big test at the club in the heart of defense alongside Laurent Koscielny. He showed good composure in the Emirates Cup and seemed unfazed against the likes of Falcao against Monaco. While both sides will be looking to finish their pre-season strong and stay on schedule for fitness at the end of a World Cup summer, there is no doubt that this game will be more than an exhibition game for fans and players alike. It might be too early to send a real statement of intent as far as the title is concerned, but the two clubs will certainly be looking for a psychological advantage over the other. Give a read to all the pieces in our Arsenal blog Dial Square. What do you think of Arsenal’s chances against Manchester City. Let us know with a comment below.